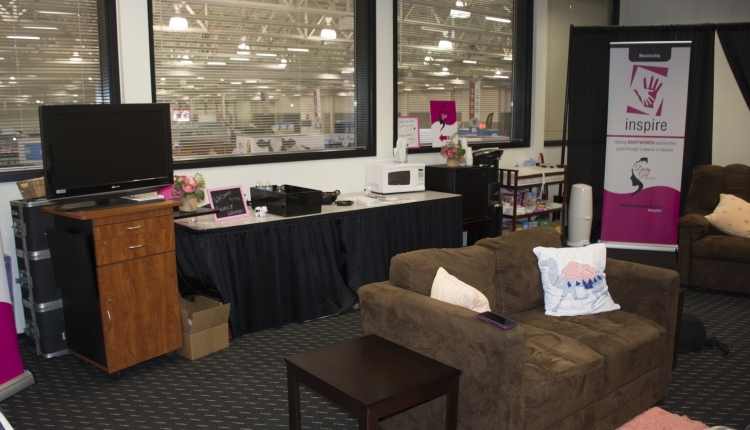 Dairy Girl Network has created places for women to meet and families to rest while at World Dairy Expo. World Dairy Expo is a family-friendly event, but anyone with young children knows that taking a trip anywhere requires extra planning, both prior to the activity and once you get there. To give families with babies and small children a comfortable place to eat, change diapers, or simply relax, the Dairy Girl Network is excited to once again be providing a Family Lounge on the Expo grounds. Located on the second floor of the Exhibition Hall, the lounge includes a diaper changing station and supplies, snacks and drinks, two private pumping areas, temporary refrigerator storage, a microwave, and toys for young children to play with. The room is available to anyone at World Dairy Expo. People made good use of the space in previous years. Gilbertson said that beyond Expo attendees, many mothers working in trade show booths and caring for cattle also made routine stops to the lounge. New in 2018, parents will have the opportunity to connect with lactation consultant Laura Wilson from the American Family Children’s Hospital and University Hospital at UW Health in Madison, Wis. Wilson grew up on a small family dairy farm and is an International Board Certified Lactation Consultant (IBCLC) with 17 years of experience working with infants and their families. She will visit the Expo Family Lounge on Thursday from 3 p.m. to 4 p.m. and Saturday from 9 a.m. to 10 a.m.
For females involved with agriculture, the annual Dairy Girl Network “Expo Connect Networking Event” will be held on Wednesday, October 3, from 5:30 p.m. to 9:00 p.m. This year it will be held at a new location, the Sheraton Madison Hotel, which is across the street from the Expo grounds. Click here for more information and to register. Another event for dairywomen will be held on Friday, October 5 from 11:00 a.m. to 1:00 p.m. This educational seminar put on by the Dairy Girl Network will feature Jolene Brown, a professional speaker, author, and farmer. She will share realistic ideas to bring balance to both work and family life during challenging times. Registration for that seminar can also be found at the link above. There’s something for everyone at World Dairy Expo. These additions provide even more for young families and dairywomen to enjoy.